We have all know that it is cheaper to retain a customer than to acquire one. Yet many companies are solely focusing on acquiring new customers instead of doing relationship marketing with their existing customers to sell their products. Surprisingly, most companies don’t seem to value their existing customers anywhere near as much as new customers. If you’re still not convinced to start focusing on selling to your existing customers, here is a list of top reasons. The probability of selling to an existing customer is 60-70% whereas selling to a new prospect is 5-20%. The above stats clearly indicate that selling to existing customers is easier and more profitable in the long run. When it comes to building a relationship with your customers and retaining them for long term, email marketing is inevitable. Having said that, you shouldn’t limit your retention strategies solely to emails. In fact, as competition rises and tons of emails are hitting the inbox of an average user, it is hard to get noticed and in turn harder to build a long lasting relationship with your customers. As an alternative approach to customer retention, Facebook marketing could be the right choice. With more than a billion active users, it is very likely that your existing customers are residing on Facebook, which makes it one of the best places to start building relationship marketing. 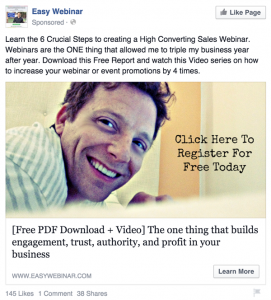 In this post, let’s take a look at how to find your existing customers on Facebook and start selling them right away. One of the main benefits of having an email list is that you can send them customized targeted emails on a regular basis, which increases the likelihood of repeat purchases. Additionally, once you have a list, you can find your existing customers accurately on Facebook and advertise them with targeted ads. If you haven’t started building an email list yet, below are a few tips that will really help you get started. Make your website ready for growing an email list: It is always better to grow your list using a landing page. Drive traffic to your landing page that is created specifically for growing your list. You can create an HTML landing page easily and upload it to your host or if you’re on WordPress, install any popular landing page plugin on your site, so you don’t need to worry about HTML coding. Make sure you create a beautiful optin form on your landing page. Use interest targeting: Unlike search ads, Facebook ads are not highly targeted because prospects are not looking for any specific information while on Facebook. However, interest targeting allows you to find the right audience for your campaign based on the users’ hobbies, activities, job titles and the Pages they like. Create an ad: In your ad, tell exactly what your prospects can expect from your landing page. Make the call-to-action crystal clear. If you’re looking for an inspiration, below is an example of a great ad for growing an email list. Once you built an email list, you’re all set to retain them on Facebook using Custom Audience. Facebook Custom Audience allows you to upload your email list to Facebook database and compare them with that of the Facebook users and if you find a match, you can show a customized ad that reflects the behavior of each lead. You can get started with Custom Audience with 3 simple steps. Step 3: Finally, upload the imported CSV file from your email marketing tool. Your Custom Audience will be ready in 30 minutes. Now that you set up the Custom Audience, you’ll need to create an ad to display in News Feed or the right-hand column. Once the ad is set up and running, you can expand the reach by following methods. Choose CPM bidding: Generally speaking, if you’re looking for brand awareness, choose CPM bidding to expand the reach with minimal spend. With that said, if you’re not spending a lot of money on ads and are new to Facebook ads, you may need to try CPC bidding rather than CPM bidding. Test what works: Test different ads to see which one outperforms the other and choose the one to which audiences respond to best. Update your list: As your list goes you’ll want to update it in Custom Audience. This strategy ensures that your ads reach new customers as they find your business. Target prospects for 180 days: Once someone purchase from your website, you can target them for next 180 days. This can be a great tactic especially if you’re looking to cross sell related products to the customers who recently made a purchase on your website. Let’s take a look at how you can use Facebook Custom Audience to target your potential customers. 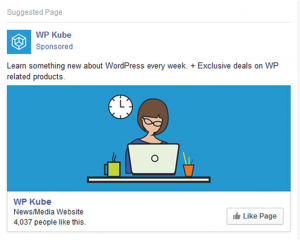 When you’re releasing new products, you can spread the word by showing an ad that targets your potential customers. Below is one of the examples of an ad that targeted me using Custom Audience. 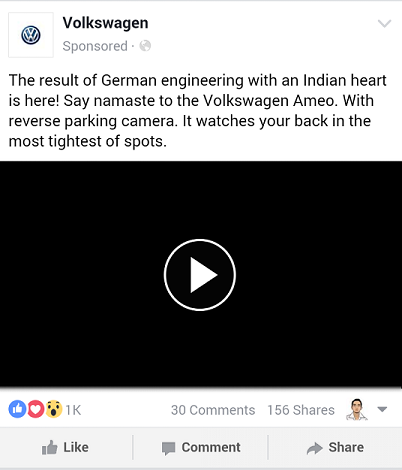 As I’ve previously shown an interest in Volkswagen car and they had my personal phone number, this ad targets me on my Facebook News Feed. 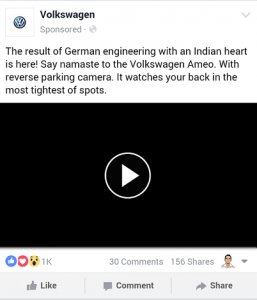 This ad tells a feature of one of their newly launched cars. 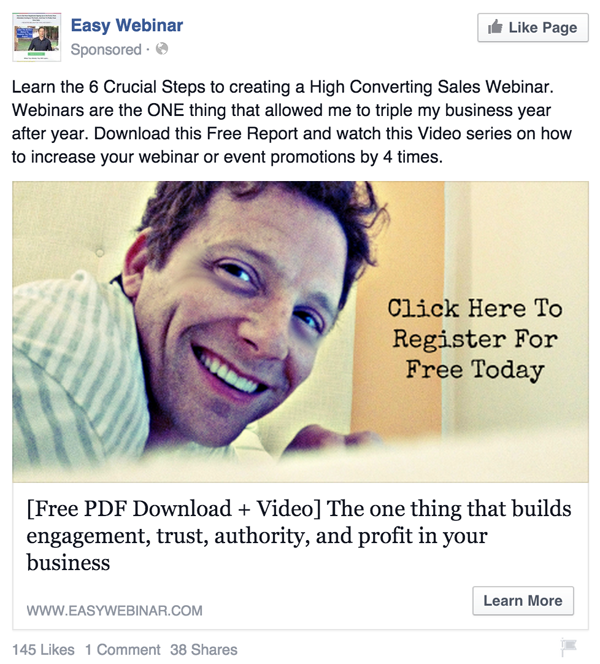 If you recently made a sale, you can cross-sell a related product on Facebook. For example, if you sold a mobile phone, you can cross-sell accessories such as phone cover by promoting the product on the users’ Facebook wall. Cross-selling can be handy especially if you’re in the ecommerce industry, so you can target them precisely on Facebook, which increases the chance to make a sale. If you can make your potential customers like your Facebook Page, you can retain them for a long-term relationship. This is a sustainable marketing strategy because you can show your latest posts on your fans’ News Feed whenever you publish them on your Facebook Page. Additionally, by making your fans like your page, you’re moving one step forward to gaining a loyal brand advocate who will be ready to promote your brand without having you to spend another penny on an ad. 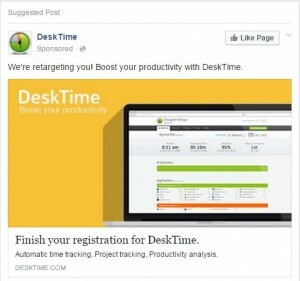 Retargeting allows you to target your customers on Facebook who have previously visited your website, used your mobile app or made a purchase around a certain time of a year. The best thing about retargeting is it appears only when your customers have shown an interest in your brand. All you need to do is to install Facebook pixel on your website, so you can retarget them on Facebook. What is your favorite retention strategy on Facebook? Share your thoughts with us in the comments section.